(CNN) – Attack politics, déjà vu? Republican Mitt Romney and Democrat John Kerry may not agree on much, but a new web video by Romney's rival Newt Gingrich aligns the two, right down to their shared command of French. "Bonjour, je m'appelle Mitt Romney," the former Massachusetts governor says in the web spot, produced by the former House speaker's campaign. 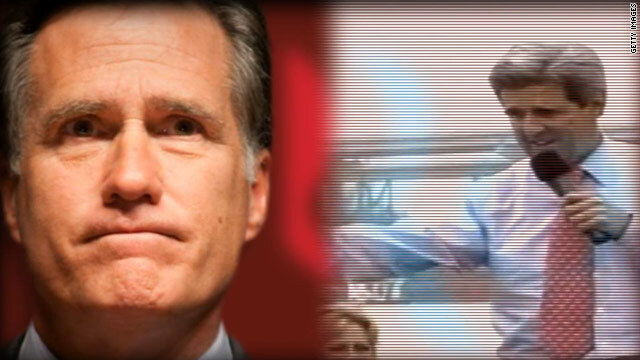 Romney lived in France as a Mormon missionary in his college years. The web ad, posted to YouTube Thursday, shows Romney as the next in a line of Massachusetts politicians who make conservatives' stomachs turn. In the 2008 campaign, Republicans criticized Massachusetts Senator Kerry, then the Democrats' presidential nominee, for his fluency in the romance language. In the era when "freedom fries" replaced "French fries" as a political statement, some unfavorably perceived Kerry as "too French." wow and Jon Huntsman spoke Chinese at one of the debates. Newt is pulling out all the stops here because he knows what pulls at the strings of his conservative right wing base. They HATE the French (remember "freedom fries"?) and diversity and the ability to speak another language makes you a SNOB. I don't agree with Romney on much of anything but even I think this is just taking stuff too far. But narrow minds tend to think alike. The far right thrives on the "he's not one of us" fear mantra. "In the 2008 campaign, Republicans criticized Massachusetts Senator Kerry, then the Democrats' presidential nominee, for his fluency in the romance language." Wasn't Kerry the presidental nominee in 2004 not 2008? "In the 2008 campaign, Republicans criticized Massachusetts Senator Kerry, then the Democrats' presidential nominee, for his fluency in the romance language." Kerry was the presidental nominee in 2004 not 2008 right? What kind of infantile criticism is this? Only in the United States are intelligence and education ridiculed. I think Newt is jealous. He can barely speak English. There is nothing wrong with being bi-lingual. In fact most Europeans speak more than one language. Only in America do we revere ignorance. Gingrich is such a hypocrite. He criticizes Romney for being educated but he has a Ph.D himself! Newt is becoming ridiculous. C'est absurde. Only in the mind of a conservative American could knowing a second language be considered a character flaw. We should all strive to only know one language so that we can forever remain in a bubble of isolationism and naivete. So will we be sending the Statue of Liberty back to France next? Remember, without the support of the French during the Revolutionary war America be the largest...I mean second largest Common Wealth in the British Empire. Is it sad that I'm not surprised? But seriously? I thought being multi-lingual was a good thing. Attacking someone for speaking a foreign language? If anything, that makes Romney more appealing–international experience is valued almost everywhere in the US, but when a presidential candidate speaks French his opponents see that as a weakness? I have difficulty seeing the logic in this. Seems like Gingrich is reaching. That is pretty horrific, a Presidential nominee knowing two languages. Kerry was the nominee in 2004. ROMNEY 2012! The more GingRICH tries to slander Romney, the more failed and ridiculous he looks. GingRICH is through. See ya... ROMNEY 2012! Seriously? When did knowing multiple languages become embarrassing? Everywhere we travel we run into people that speak 2, 3, or 4 languages fluently and I envy and admire the opportunities that enable them to interact with some many in different cultures. It is reprehensible that anyone in America would say that learning a second language was anything less than admirable. These attacks are petty and simply extend more of just how ignorant we are as a country to the eyes of the rest of the world. John Kerry ran in 2004, not 2008. Republicans are attacking each other for being educated, cosmopolitan, and recognizing that there are languages other than English, which are spoken by millions of people who are supposed to be our allies. Should we be surprised or just look back with a tear in our eye at old fotos of W? Only in a Republican primary can the ability to speak more than one lanuage be seen as a detriment. No fan of Romney here, but really? That's the best Newt can do?